Number 22! That would be Liz who knits in her research lab. I just love down time at work, don’t you? I’m impressed with the yarn prowess out there. Knitting while walking a dog? In the bathtub? Kudos to you all! Nicole L. and Marlene – than you for sharing. Ahem. I love the idea of knitting in a bar. And at a casino. Actually, I like the idea of doing odd things at any inappropriate time or place. But what about the cigarette smoke? Isn’t that a problem? And one has to wonder if all the labor/hospital knitters are the reason for things like these and this. WARNING: the first link is not for the faint of heart; it contains photos of crafted naughty bits. Can we say, “too much time on their hands”? I thank you all for playing, and I hope you will stay tuned for more exciting adventures. And in case that’s not enough – more free stuff. I had no idea I was so good at marketing myself! I expected a much smaller response, so I have decided to close this contest earlier than expected. This way, the odds won’t be so paltry for everyone. The contest now officially closes at noon EST February 1st. Please remember that I cannot ship internationally, so if you do not have a U.S. mailing address, you cannot win. Of course, you can still comment if you like. I will use that random integer program doo-dad to generate a number, and I will announce the winner by 3 pm February 1st. That’s tomorrow for all of you who, like me, normally have no idea what the date is. And fear not! There will be more giveaways coming. I will likely stick to needle arts supplies, and I will try to highlight WAHM wares. So if you make something beautiful for knitters and crocheters and would like some advertising for the low cost of a donated prize item, let me know! Thank you all so much for participating, and for entertaining me. And I do hope you’ll be back to follow me shamelessly using my dysfunction as writing fodder. I am so relieved to find I am not the only one who hides in the bathroom, and I cannot wait to try knitting in the bathtub. Well, here it is: the first Fiber Friday giveaway. I decided to donate my own handiwork to the cause and offer up this lusciously soft, hand-painted 100Purewool 3-ply yarn. If you aren’t familiar with Purewool, they are a wonderful supplier of Uruguayan hand dyed merino and corriedale wool yarns in a variety of weights and some really fun colorways. This was a natural three ply yarn that I hand painted in shades of eggplant, brown, maroon, orange, and some purples and blues. It knits up beautifully, as you can see in the photo below. It seems that when I paint yarn I always love it so much I have to keep some for myself. This skein is worsted weight at 218 yards and 3.5 ounces. 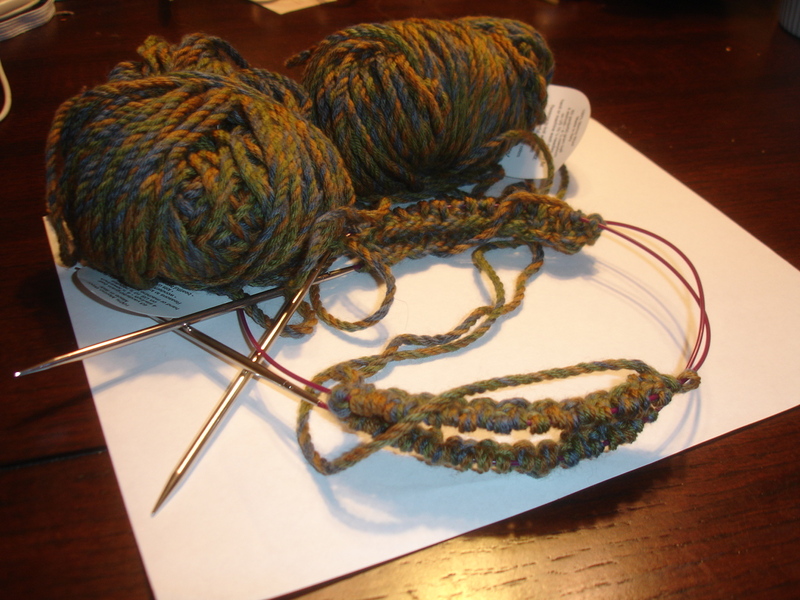 One skein would probably do a pair of shorties (hint, hint!) or some fun baby hats and booties. Or you could actually knit something for yourself for a change. Be decadent. You’re worth it. Or maybe not, what do I know? So here’s the scoop: Leave me a comment telling me the weirdest place you’ve found yourself knitting or crocheting. I’ll tell you mine: on a bus in NYC after a day of kicking around town. My baby was attached to my breast. I’m a multitasker, what can I say? And you don’t win by being the weirdest. I already occupy that spot. Instead, I will choose the winner from both entries by randomly drawing a name from the empty bucket of Sam’s Club cheese balls that I finished off the other night. I promise not to get artificial cheese powder on your yarn. I’ll announce the winner next Friday, February 6. Comments will close at 8 p.m. Thursday, February 5. Please note this contest is for U.S. Shipping addresses ONLY. Pass it on! If you don’t know about Sheepy Pants, go check them out. It is absolutely the best pattern out there. Amanda Harrington (the awesome designer) does an excellent job of explaining all the different techniques, including the kitchener stitch. I think I might need some serious help. I have decided to knit my first pair of socks, learn how to knit continental style, and do all of this on two circular needles. At the same time. Any of these things would be a great challenge in and of itself, but me? I choose to do all three. I haven’t been knitting lately, and we had a few cool days here in Virginia that put me in the mood for wool. I broke out the longies for baby B, dressed the wee ones in long sleeves – I even got to wear a snuggly sweater. Then I hit the stash. There is a reason knitters call their supply of yarn “the stash” and anyone who knows what I am talking about surely doesn’t need it explained that drug users also call their supply – you guessed it – their stash. I realized long ago that my yarn habit was filling an emotional void, meeting needs that weren’t getting met elsewhere. Of course, now my needs are being met for the most part, so what do I do with all this wool? I press on, folks. After all, obssession is as much about discipline as it is about misdirected, maladaptive instinct, and I am nothing if not disciplined. So the socks – a great quickie pattern from Knitty called Thuja, they use worsted weight yarn, which means super thick, springy socks that I cannot wait to get on my feet. Okay, they are supposed to be for men, but I’m thinking I can live with them a little loose plus I knit pretty tightly. Anything, ANYTHING, to avoid using sock yarn. Isn’t that the definition of madness? Sock yarn is like golf – everything is impossibly small and far, far away (in distance or time). I have high hopes that these socks will be ready in time for fall, along with the shawl I started in July. With any luck, I can even make myself a hat to cover the still-nearly-bald head before winter.